Infancy is a precious time full of growth and development. Our Infant Program provides infants with a safe, comfortable, and nurturing environment where each infant’s growth and development is supported by our caring teachers. 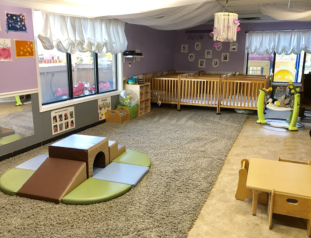 Our infant room staff is carefully selected based on their ability to provide loving, supportive, nurturing care to the youngest members of our family of learners. All staff is trained in Shaken Baby, SIDS, CPR, First Aid, and our infant policies and procedures. Our infant room staff members also receive on-going training in infant development throughout the year. Communication between you and your infant’s Teacher is vital to you knowing your child is safe, loved, and cared for as well as to their success. 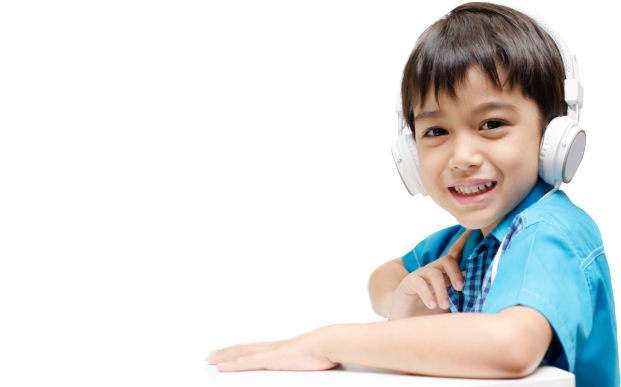 Our Infant Room Teacher will provide you with a written report each day containing information about your child’s naps, meals, diaper changes, along with a special note about your child’s day. 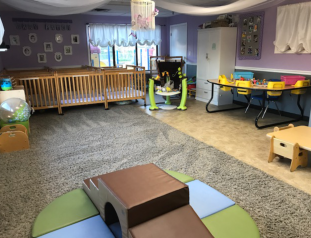 Our Infant Room Staff also prides itself in taking time to talk to you each day at drop-off and pick-up to discuss your child with you and address any questions, suggestions, and concerns. The Little Growing Mind. . .
We know infants grow and develop at an individual pace. With this in mind our Infant Room Teacher designs an individual lesson plan for each infant based on their growing and changing development. The lesson plans include: art, sensory, creative play, fine motor, gross motor, and language development activities centered on a theme. All of the activities are based on goals that the Teacher sets with you for your child. Studies have shown that using sign language with infants helps them communicate needs before their speech develops while also encouraging speech development by combining actions and words. Our caregivers work with the infants on using baby signs to communicate basic needs and words like water, eat, please, thank you, and all done. Fresh, nutritious meals are important to your infant’s development. All of the meals we serve are freshly prepared in the Pumpkin Patch Childcare & Learning Center Kitchen including the meals for our littlest eaters. For our littlest eaters, fresh baby food is prepared based on what you are serving at home. As your infant gets older, we slowly start introducing more solids as you do at home. Just keep us up to date on what your child is eating by using an Infant Food Form and through communicating with the teachers. We also provide your infant with the formula of your choice. Infants depend on consistency, so our infant room works with you to develop a schedule that closely mirrors the schedule you follow at home. 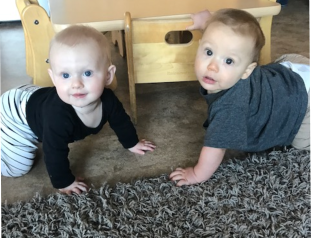 Throughout the week, your infant will get opportunities to play and explore through a variety of planned activities and through self-exploration. Your infant will also get to play outside on our Infant/Toddler Playground and go for stroller rides around our property when the weather is nice. Once a child turns 1 year, we start transitioning them onto our toddler room schedule in gradual steps to help prepare them for this exciting move. When you pick-up your infant make sure to take the Daily Report to get all of the information about your infant’s day.